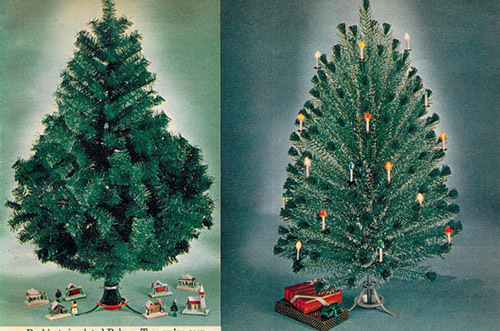 Artificial Christmas Trees! 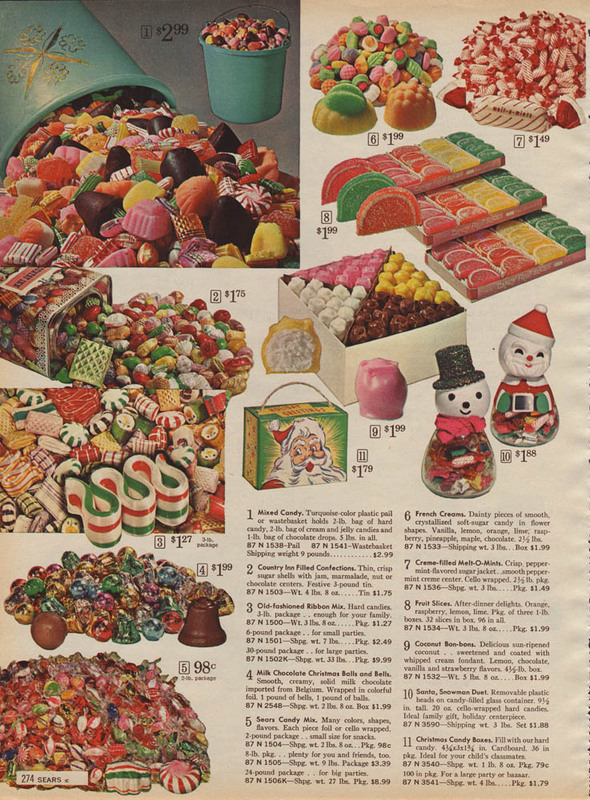 A Vintage Catalog Extravaganza! 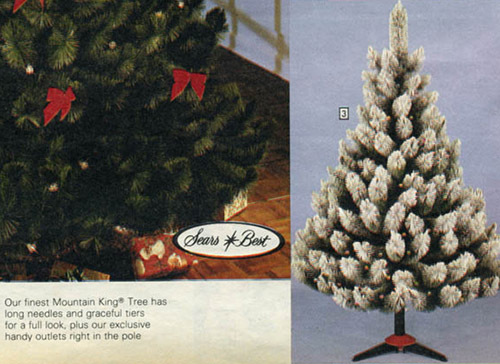 In this entry to the Christmas Catalog Extravaganza series, I give you Artificial Christmas Trees! 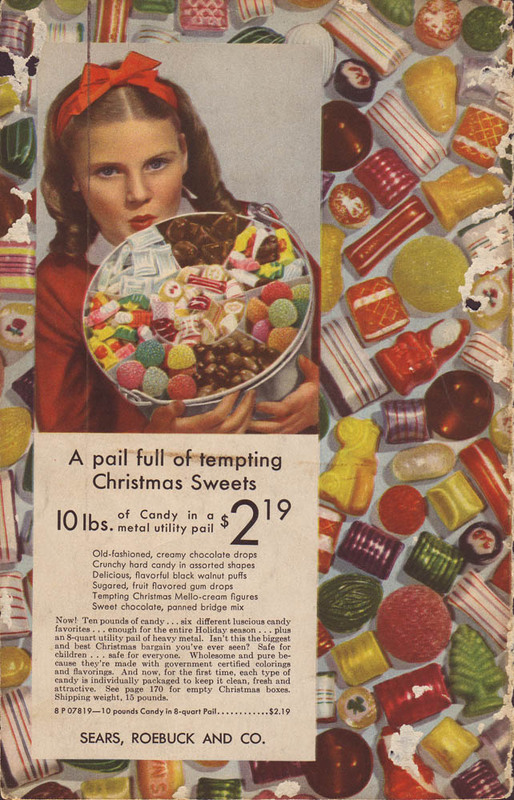 I really thought this was a rather recent invention, but a little research proved me entirely wrong. Check out Wikipedia for the full history. 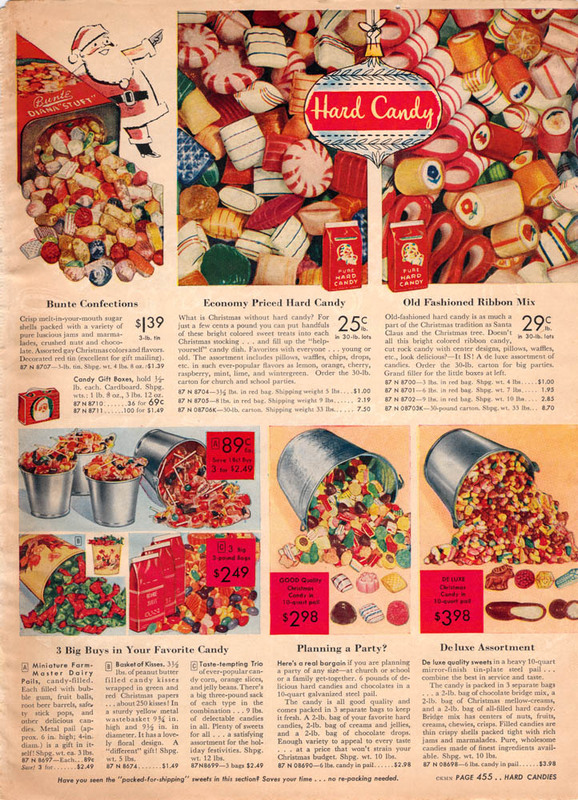 In terms of these catalogs though, 1942 is one of the first advertised versions I found, proudly exaulting the low cost and the lack of falling needles. But first, a little about me. When I was growing up, my father would march into the lush pine wooded forests of Vermont on December 10th, hickory handled axe perched over his shoulder. His quest? 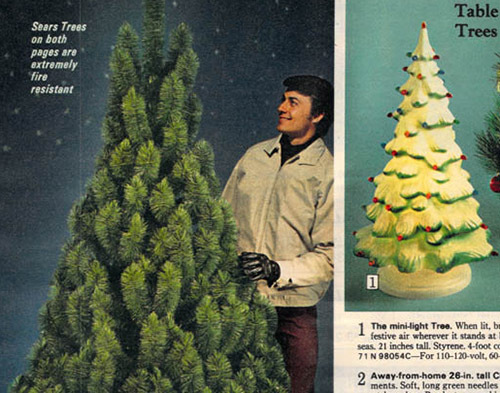 To find that one perfect Fraser Fir. He would fell the noble tree in one great motion and drag home to our log cabin. 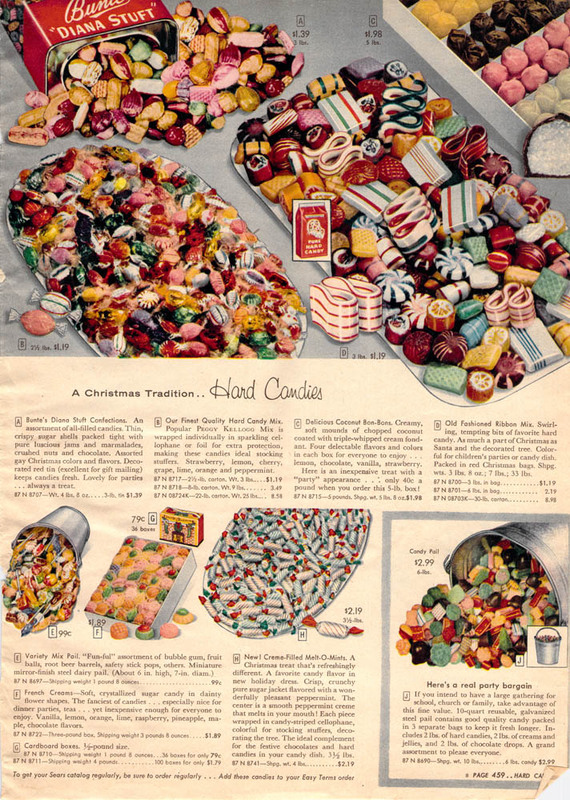 His job done, my mother and I would decorate the tree with festive glass ornaments and strings of popcorn, while dad read the paper and sipped a tumbler of Jameson. I hid the pickle in the tree. 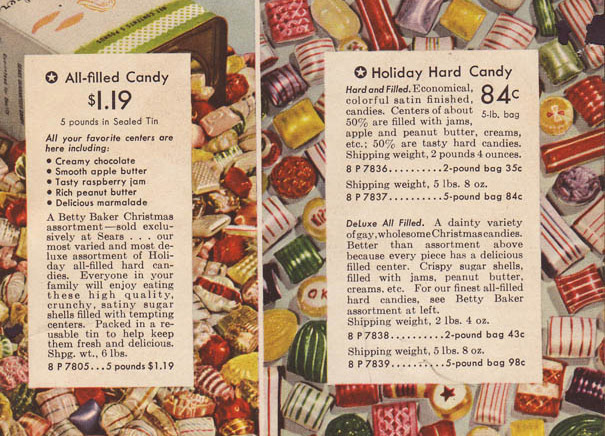 Then we’d settle in to sip eggnog and watch “White Christmas” or “The Bells of Saint Mary’s”. This Norman Rockwell / Charles Wysocki version of my family’s Christmas tree tradition is, of course, only partly true. The reality was, we lived in Homestead, Florida. 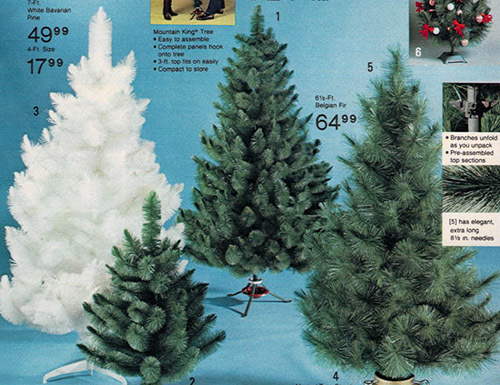 The only naturally growing real pine trees were usually about 70 feet tall, so they weren’t quite right for decorating. 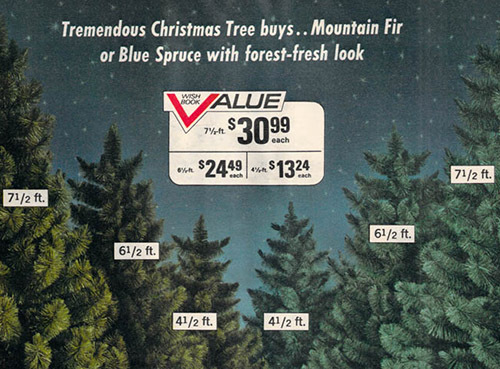 We usually hit a few of the Christmas tree tents running down US1 in Cutler Ridge, trying to find a tree that hit that perfect ratio between size and price. 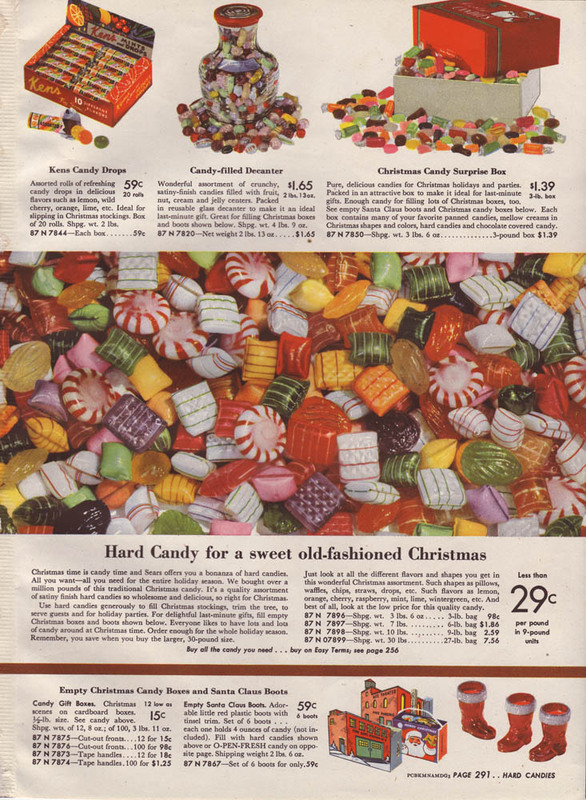 We wanted a six or seven footer, but dad wasn’t into paying a bundle for it either. My mom also had a prejudice against Scotch Pines, which I have adopted as my own. We were a fir and spruce family. Usually, we’d find one that looked great from one side and had a deformity on the other. 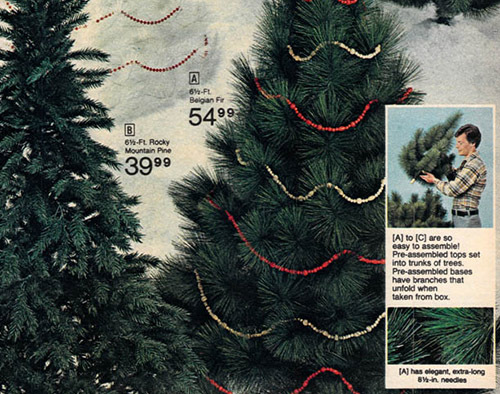 Tall tree, plus deformity equals lower price, so that was the one for us. We’d stick our purchase in the back of the pickup. When we got home, dad would saw an inch off the bottom so it would fit properly into the tree stand. Take it inside the house and rotate it until the best side was up front. 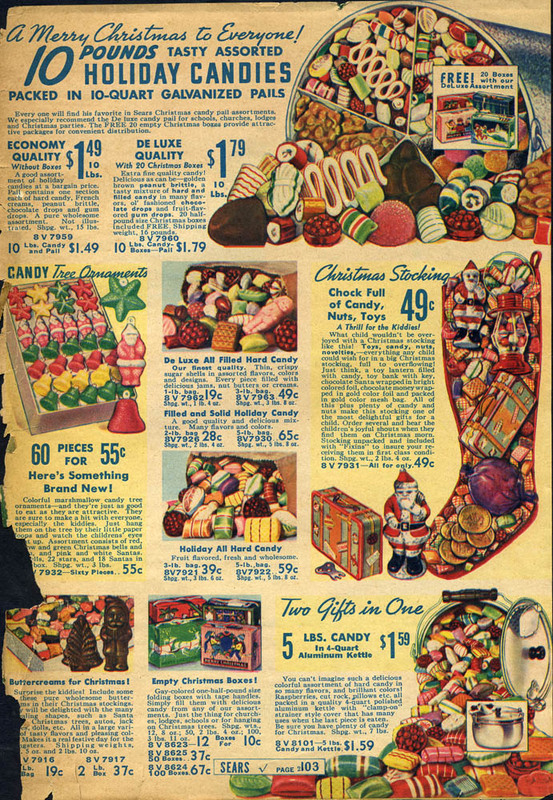 It was never level when we first stood it up, so my mom borrowed a couple of my Archie Comics to stick under whichever leg the tree was listing towards. The rest of the story, where mom and I decorated while dad sipped whiskey, that’s all pretty accurate. 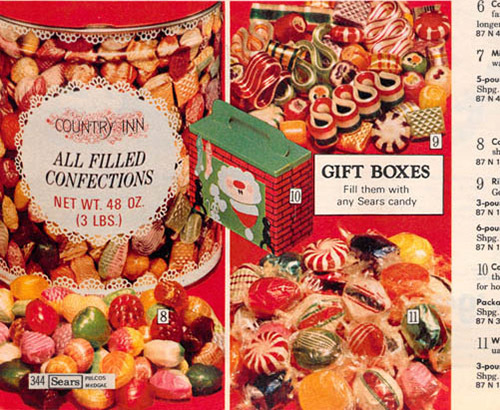 I guess my point is, when I was growing up, my family was going for as much holiday tradition as possible. 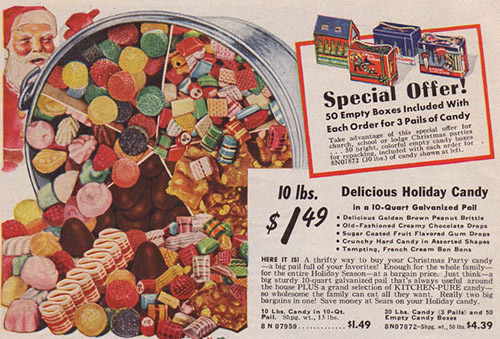 Christmas was too special to replace a natural tree with a pile of green metal and plastic. Years later, this would all change. 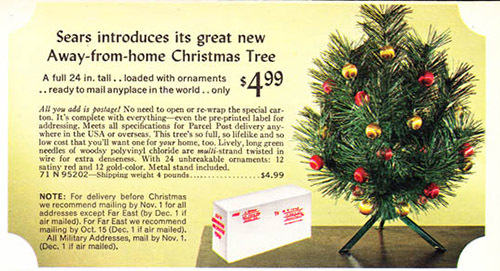 By the time I was in my teens, we had purchased a high quality artificial tree. 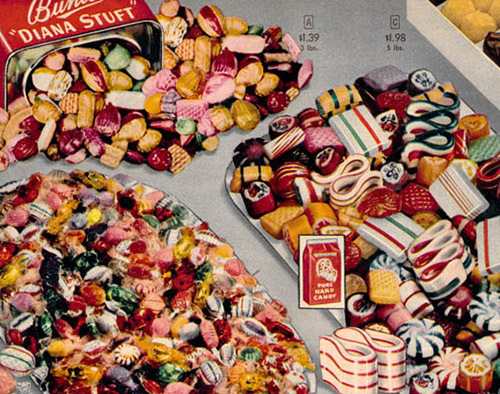 It all came down to the recurring annual hassle and of course, the cost involved. 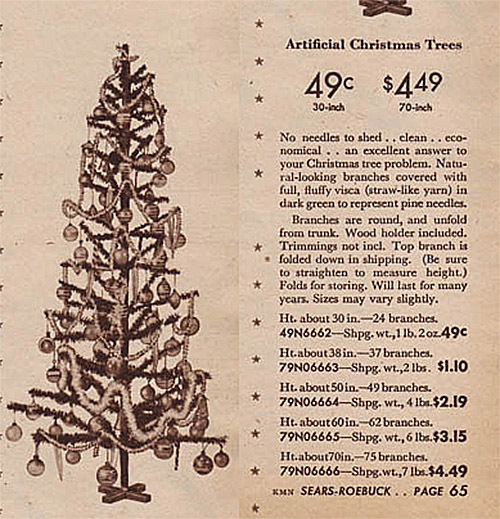 For the price of a real tree or two, you could have a very authentic looking fake tree that was easy to assemble and would last many years. I have a fake tree now, but if Ginny and I ever have kids, we might be tempted to buy a real one for a few years, just to give our kids the experience of owning a real, forest grown Christmas Tree. 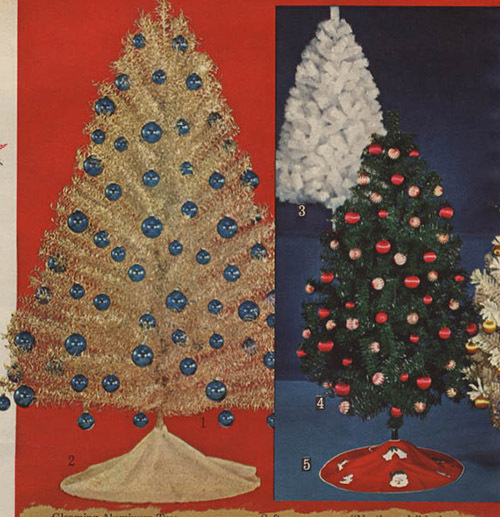 As established already, this is a tribute to the all American fake Christmas tree. 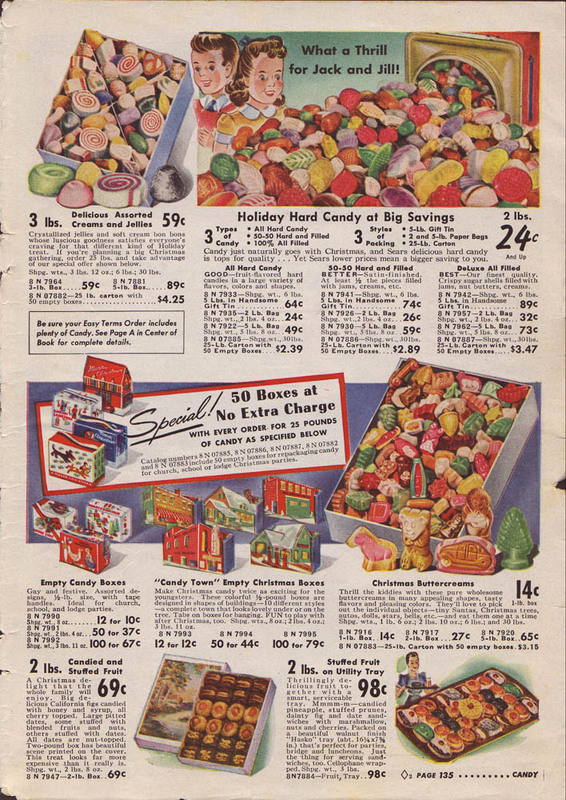 Taken from the pages of vintage Sears catalogs from 1942 through 1983, you can almost smell the pine scented candles used to create a festive evergreen smell in the absence of a real tree. 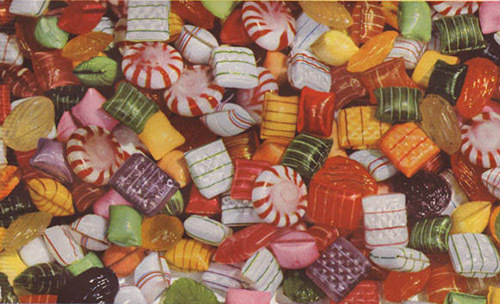 Thanks again to Wishbookweb.com for making these scans available. 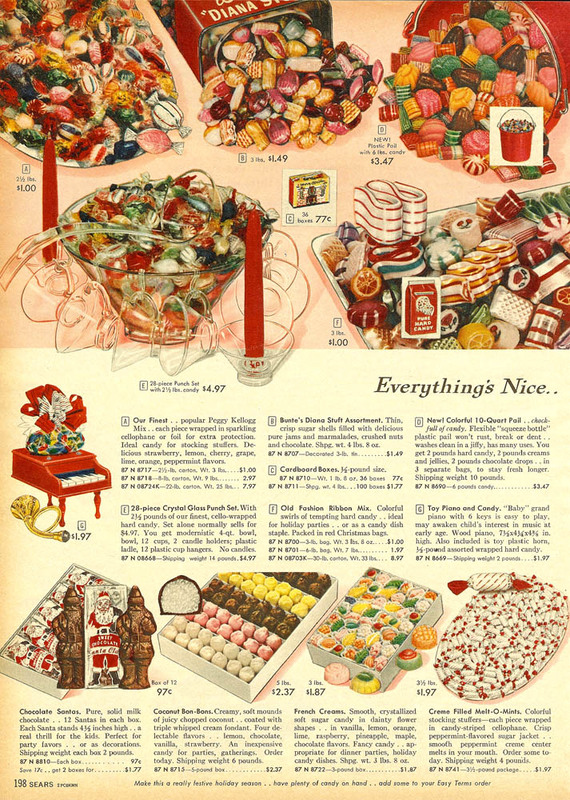 If you’re into 20th century advertising design, department store history or just enjoy looking at the Christmas catalogs from your childhood, this is an amazing website! Go there! 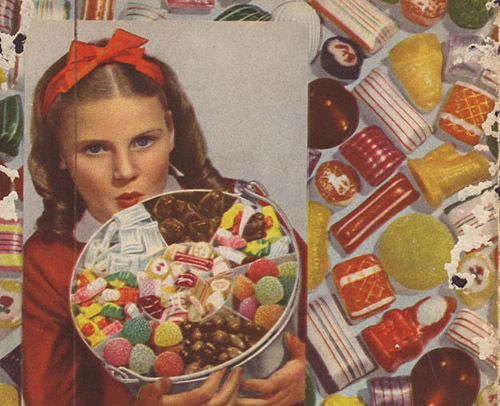 We start with 1942. The artificial Christmas tree starts out pretty weak. That is not a lot of branches and definitely not a lot of variation in shape or length. To be honest, this looks like it was a made out of a bunch of pipe cleaners. 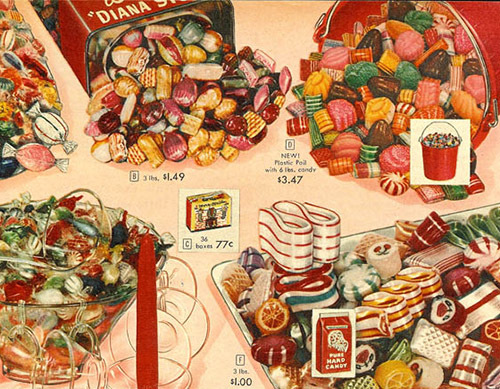 But hey it’s a start, and at only 49 cents, quite a bargain! Another tree that is barely there. Charlie Brown’s Christmas tree indeed. 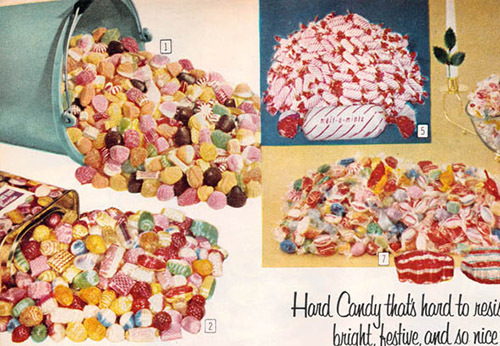 Still, if you manage to put enough ornaments on it, it could be very festive. We’re improving. The one on the left is pretty bare, but the one on the right is quite good considering what came before. 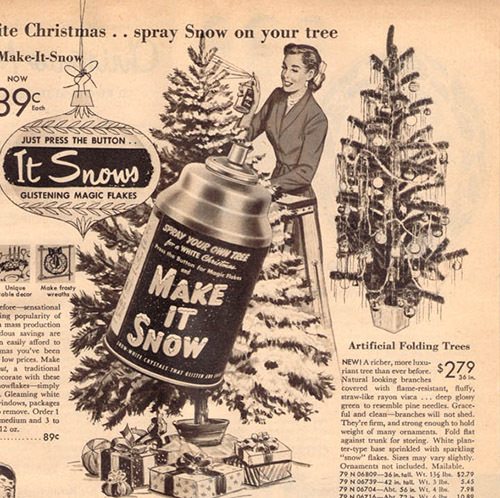 There’s a fake tree on the right, but the “Make It Snow” spray snow is what really intrigues me in this ad. “Just Press the Button. 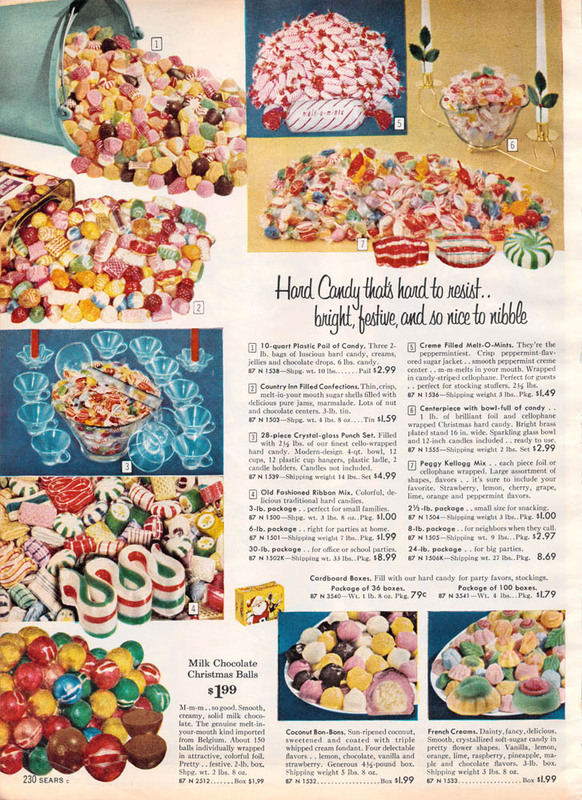 It Snows Glistening Magic Flakes.” The ad doesn’t tell you about the chemical ingredients, but I wonder how toxic that stuff was. I like these lovely colored trees. The pink one in particular. 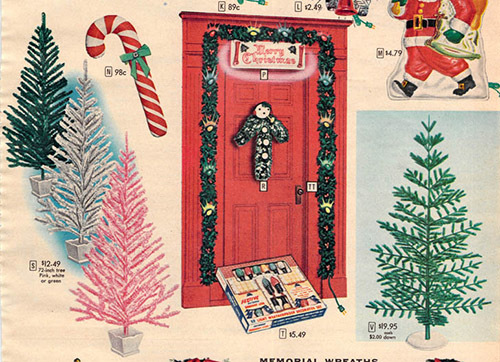 Now, can someone please explain to me the horrifying death effigy on the door? I’m serious. 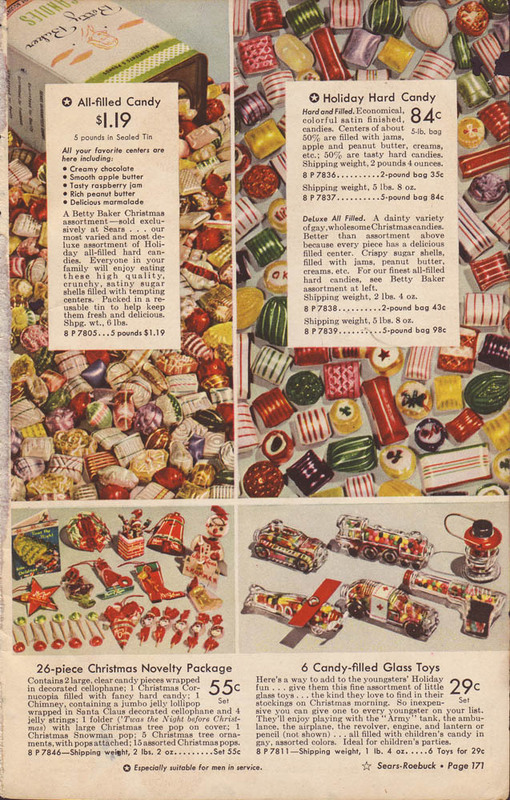 I don’t want to bring the Christmas mood down, so I won’t say what I think it looks like. I would suggest, however, that other sentient snowmen steer clear of this particular home, lest they suffer the same fate. 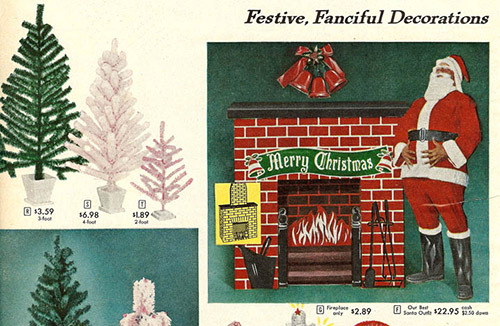 Remember the fake cardboard fireplaces you could buy to hang your stockings up on? 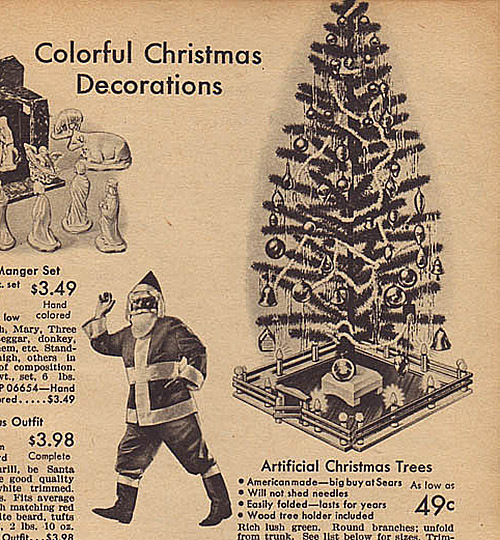 What a perfect accompaniment to your fake tree and fake Santa Suit. This is unrelated, but I just remembered that I forgot to buy eggnog when I was at the store an hour ago. I was really hoping to sip on that with some rum swirled in while I write the rest of these captions. Sorry… stream of consciousness. I love aluminum trees. I have a vintage one here in my office. The one pictured above, however, is not working for me. The copper colored pom-poms are atrocious. 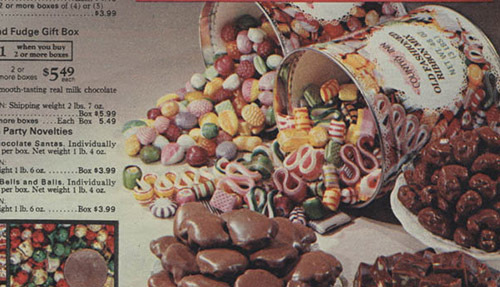 Actually, reading the copy in the ad, it appears those are supposed to be red. I supposed that would be better. This photo doesn’t do it justice though. Ugh. Two very distinct styles. The one on the left, with it’s more random and fluffy shape, is clearly meant to be naturalistic. The one on the right is much more stylized with all its branches reaching out in symmetrical predictability. Very space-age. As much as I love a real tree, or a fake tree that looks real, I’m a big fan of this space-age tree. 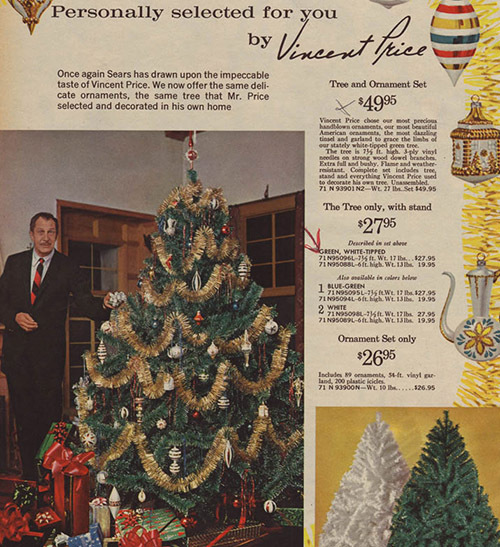 1964 Sears Catalog Artificial Christmas Tree with… Vincent Price?? Okay, hold everything. 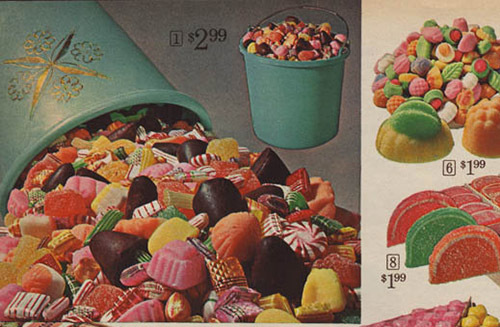 This page from the 1964 Sears catalog requires us to stop and consider. 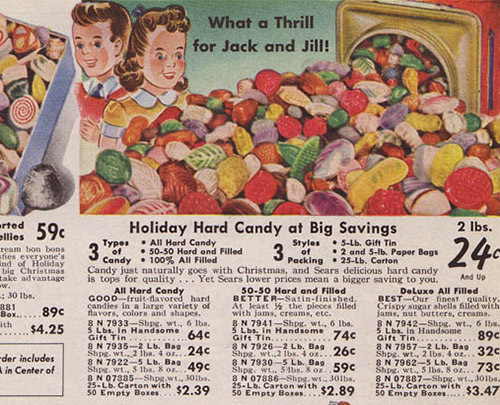 Vincent Price, star of some of the creepiest gothic horror, science fiction and mystery films of the 1950s and 1960s, had a line of home decorating accessories for Sears and Roebuck. Let that sink in. 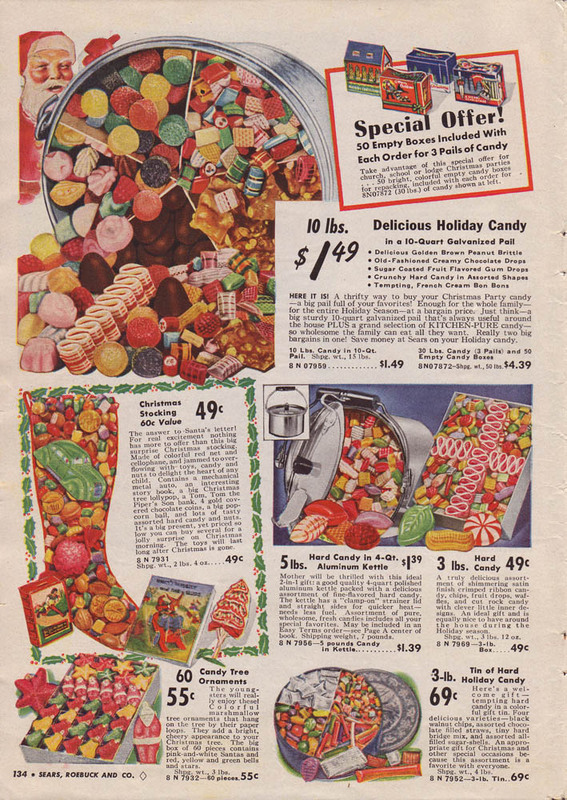 I love to think of little kids thumbing through the pages of this catalog and landing on this page after having just seen a matinee of “House on the Haunted Hill” or “The Tingler”. I have to say though, Vincent Price, the man himself, does strike me as a likely to have had good taste. I imagine his basement laboratory and torture chamber was stylishly outfitted by Gerrit Rietveld. The ‘Away-from-home’ tree. 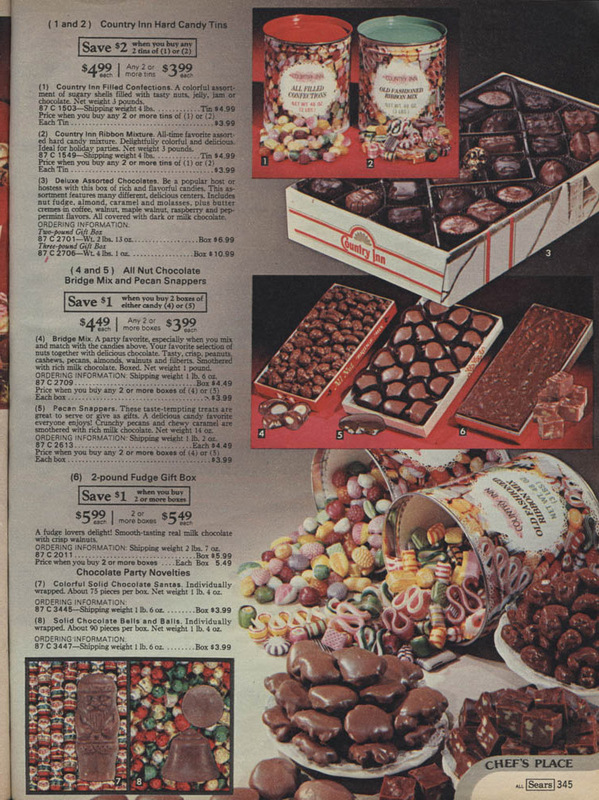 Perfect for homesick traveling salesmen. This little tree makes me a little sad, sentimental dope that I am. I hope it brought even a little bit of warmth to those lonely Fuller Brush men, Pan Am flight attendants and rock and roll roadies who it was intended for. 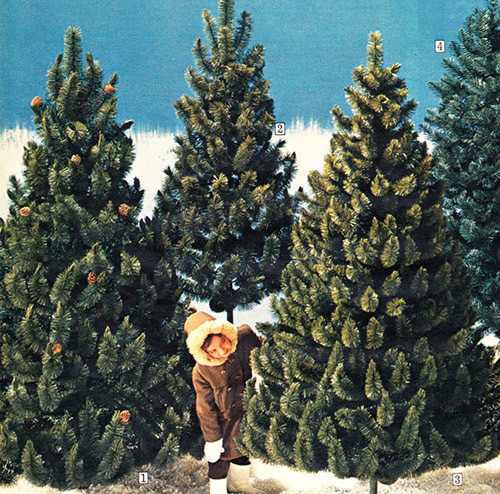 Small child in a parka, picking a tree from the artificial pine forests of the northeast. Heartwarming! 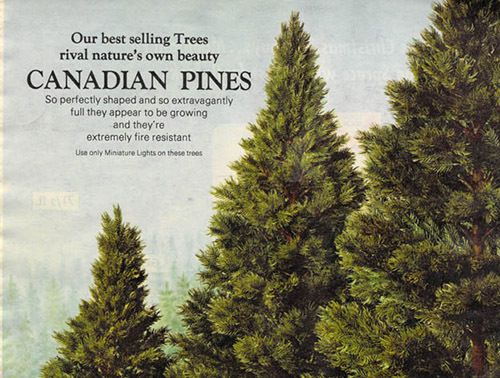 Fake Canadian Pine trees, made in Hong Kong and sold to US citizens. Our ancestors couldn’t even fathom the wonders of the future. Hey, hey buddy! 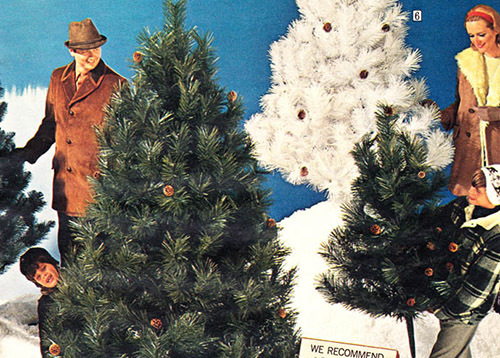 Did you think you needed your cold weather gloves to assemble your fake Christmas tree? You don’t. Also, did anyone ever tell you that you look kind of like Bill Bixby? 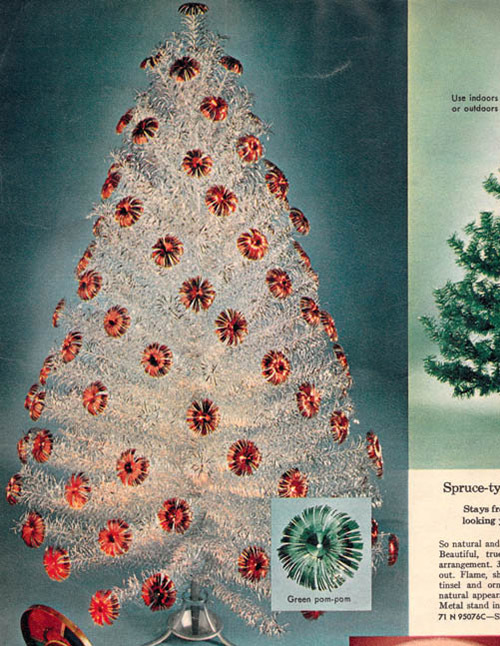 Fake trees with built in pine-cones. The realism just keeps getting more extreme. 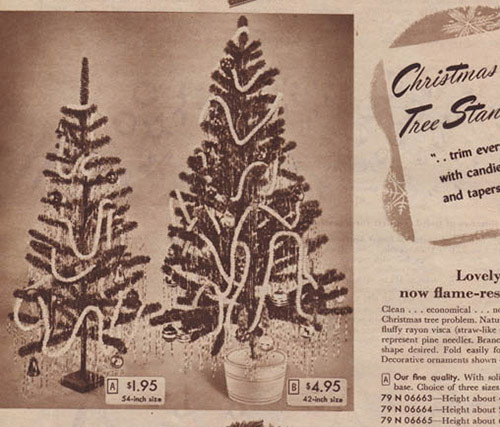 The pre-flocked artificial tree! Hooray, we’ve entered a golden age that continues to this day! 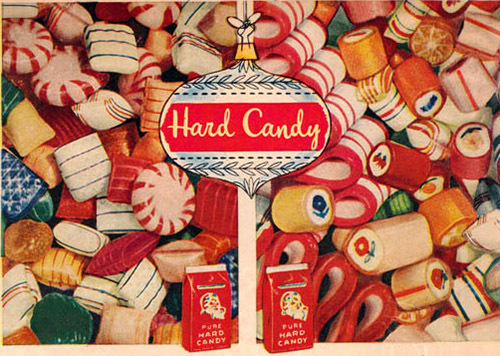 That colorful and tasty Christmas Hard Candy! 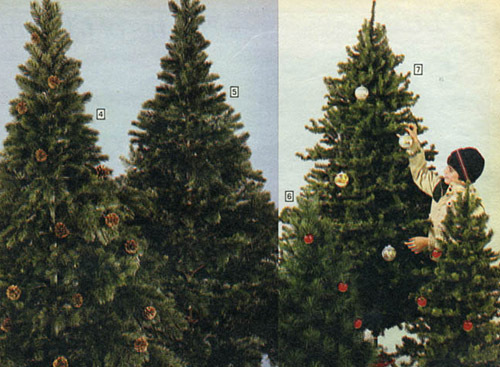 Jason Snyder http://jetpackjason.com/wp-content/uploads/jetpack_jason_logo.png Jason Snyder2015-12-12 22:22:512015-12-12 22:22:51Artificial Christmas Trees! 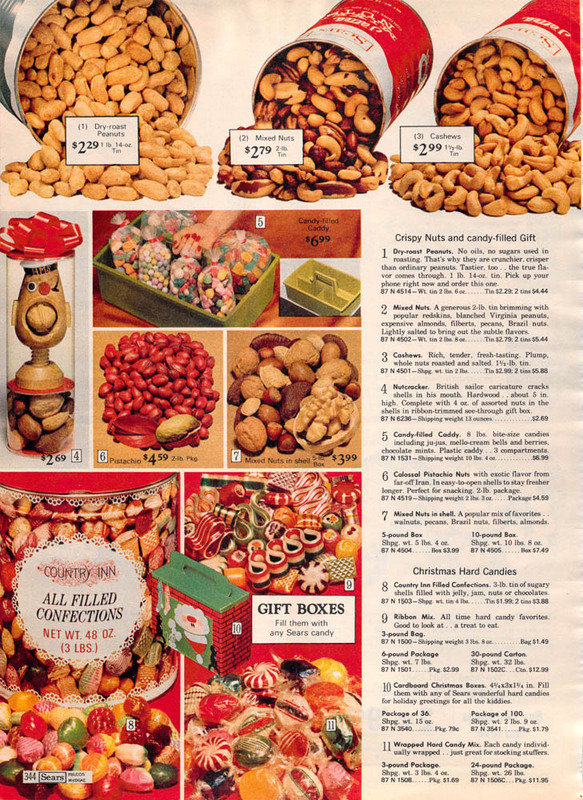 A Vintage Catalog Extravaganza!